Article Snippet: Applied Biosystems Taqman Gene expression assays were used to perform quantitative (real time) RT-PCR (human delta-sarcoglycan, Hs01087180_m1 and fly ribosomal protein L32, Dm02151827_g1 for endogenous control). Article Snippet: After blocking in 15% fetal calf serum (FCS) for 30 min at room temperature, samples were incubated overnight at +4°C with mouse monoclonal beta-sarcoglycan antibodies (Leica Biosystems, NCL-L-b-SARC). 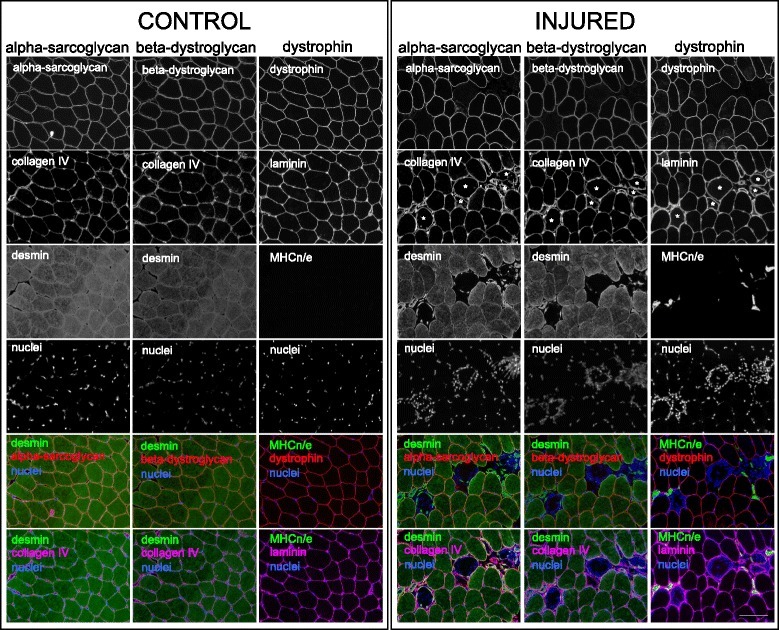 Figure Lengend Snippet: Morphological and molecular evidences of myocardial hypertrophy progression. (A) Immunohistochemical staining of beta- sarcoglycan allowing to detect outer membrane showing clear increase of cells size in transverse orientation by 10-weeks group compared to intact. (B) Increase in cell diameter (Dmin) illustrating progressive cardiomyocytes enlargement, and significant increase after 8 and 10 weeks of aortic banding performing. 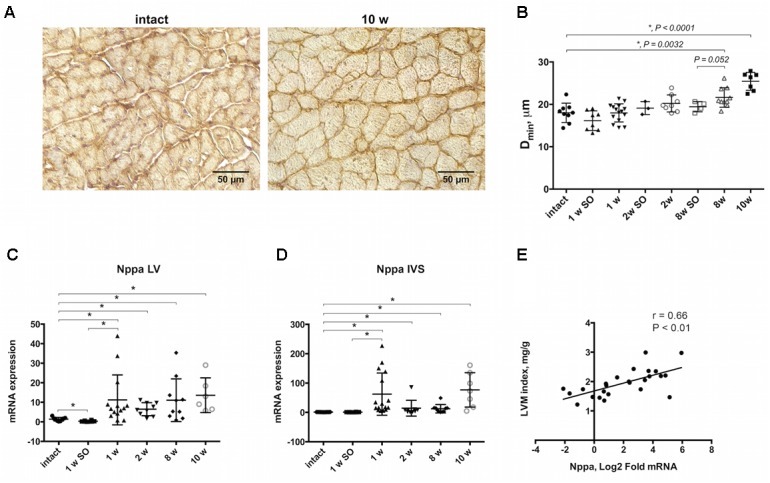 Nppa expression was upregulated in LV (C) and IVS (D) after 1, 2, 8, and 10 weeks of model duration compared to intact or sham-control groups. (E) Positive linear correlation was found for Nppa mRNA level and left ventricular mass (LVM) indexed to body weight. The analysis included experimental groups after 8 and 10 weeks of aortic constriction, 8 week’s sham-operated and intact animals, r indicates Pearson coefficient; for all ∗ P < 0.05. Figure Lengend Snippet: Broad sarcolemmal distribution of compensatory proteins upon Akt activation. Immunohistochemical analyses on transverse quadriceps sections in WT STG, WT DTG, mdx STG and mdx DTG mice. Sections were stained with antibodies to dystrophin (Dys), utrophin (Utrn), β1D integrin, alpha- and beta-dystroglycan (α-DG, β-DG), alpha-, beta- and gamma-sarcoglycan (α-SG, β-SG, γ-SG) and sarcospan (SSPN), and visualized using indirect immunofluorescence. 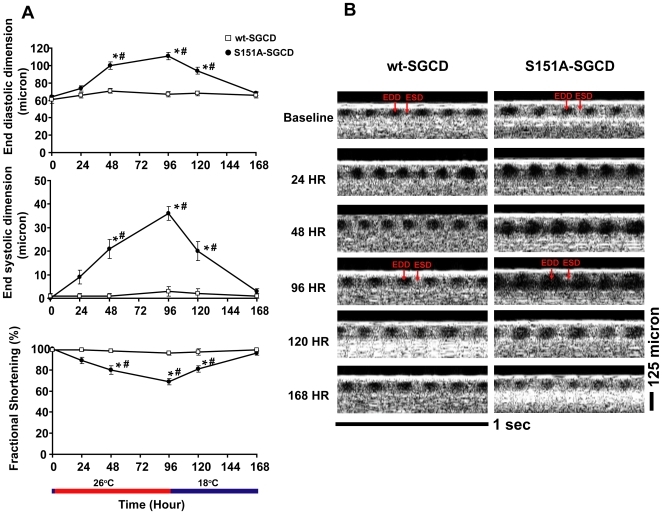 Increased expression of the DGC and UGC in WT mice was observed upon constitutive activation of Akt1. Akt activation increased expression of only the UGC in mdx mice. An increase in utrophin levels was observed in mdx mice relative to levels in WT mice. In both WT mice and in mdx mice, Akt activation increased the expression of β1D integrin. Bar, 50 µm. Article Snippet: Primary antibodies against proteins in the DGC and UGC and their respective concentrations include dystrophin (Vector Laboratories, Burlingame, CA, USA; VP-D507, 1:2), utrophin (University of Iowa, Hybridoma Facility; MANCHO3, 1:200), α-DG (Upstate Cell Signaling Solutions, Lake Placid, NY, USA; IIH6, 1:700), β-DG (University of Iowa, Hybridoma Facility; MANDAG2, 1:10), α-SG (Vector Laboratories; VP-A105, 1:20), β-SG (Vector Laboratories; VP-B206, 1:100), γ-SG (Vector Laboratories; VP-G803, 1:200) and SSPN [Rabbit 3 (described previously in ), 1:50]. α7 Integrin antibody (Santa Cruz Biotechnology, Inc., Santa Cruz, CA; L-17) was diluted 1:100 and α5 integrin (Abcam, Cambridge, UK; ab55988) was diluted 1:50. Figure Lengend Snippet: Akt increases expression of compensatory proteins in mdx mice. 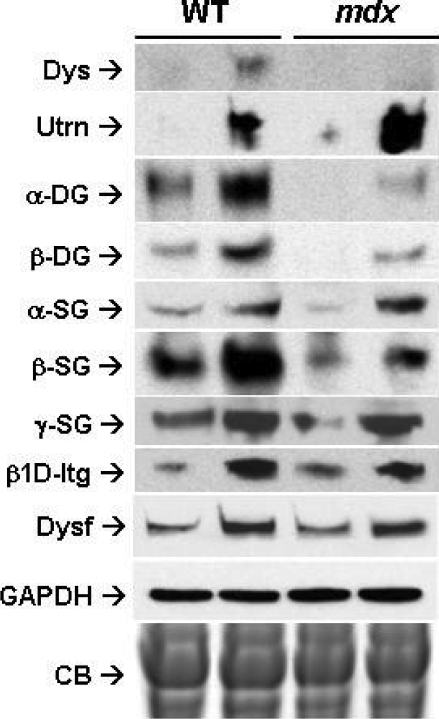 Immunoblotting for several glycoprotein complexes (DGC, UGC, integrin) on skeletal muscle lysates from six-week-old WT STG, WT DTG, mdx STG, and mdx DTG mice. Identical membranes were probed with antibodies against dystrophin (Dys), utrophin (Utrn), alpha- and beta-dystroglycan (α-DG, β-DG), alpha-, beta- and gamma-sarcoglycan (α-SG, β-SG, γ-SG), β1D integrin and dysferlin (Dysf). GADPH immunoblotting and Coomassie blue (CB) staining of total protein are shown on the bottom panels as a loading controls. Constitutive Akt activation increased the expression of the DGC and UGC in WT mice. Utrophin levels increased in mdx mice compared to those of WT mice. Increased expression of β1D integrin and dysferlin was observed upon Akt activation in both WT mice and in mdx mice. Figure Lengend Snippet: The biglycan core polypeptide is sufficient for binding to both immobilized and soluble α- and γ-sarcoglycan A. Purified recombinant biglycan core polypeptide (1μg) was separated by SDS-PAGE and either silver stained or blotted and probed as described above. α-Dystroglycan did not bind to this GAG-free biglycan. In contrast, both α- and γ- sarcoglycan bind to the biglycan core polypeptide. B. Co-immunoprecipitation of purified recombinant biglycan to recombinant sarcoglycans. His-tagged biglycan core polypeptide (0.5μg/ml) was incubated with the indicated 35 S-methionine-labeled, in vitro translated sarcoglycan for 1 hr followed by either anti-biglycan (a), anti-poly-His (b) or normal rabbit Ig (c). Immune complexes were then precipitated with protein G beads and analyzed by SDS-PAGE and autoradiography. Note that both α- and γ- sarcoglycan co-immunoprecipitate with biglycan, while β- and δ- sarcoglycan do not. The labelling of the various sarcoglycans is shown by direct autoradiography of SDS-PAGE-separated in vitro translated polypeptides (‘Input’). Article Snippet: Antibodies to the sarcoglycans and other DAPC components were obtained from NovoCastra (Newcastle upon Tyne, UK). Figure Lengend Snippet: Biglycan binds to α- and γ- sarcoglycan A. Sarcoglycan binding to native biglycan. Postsynaptic membrane fractions from Torpedo electric organ (TEOM; 0.8 μg) were separated on SDS-PAGE gels, blotted onto nitrocellulose then probed with either 35 S-methionine-labelled in vitro translated α-dystroglycan or sarcoglycans (α, β, γ, or δ) and analyzed by autoradiography. α-Dystroglycan as well as α- and γ-sarcoglycan bound to a polydisperse band whose center of migration was ∼125kD. In previous work a polypeptide with identical mobility, appearance and α–dystroglycan binding capacity was purified from these fractions and shown to be the proteoglycan biglycan . No binding of β– or δ– sarcoglycan to this or any other polypeptide in these fractions was detected. B. Binding of α-dystroglycan and sarcoglycans to purified recombinant biglycan proteoglycan (Biglycan-PG). One microgram of biglycan was separated by SDS-PAGE and either stained with silver or blotted onto nitrocellulose (‘Overlay’) and probed as described above. α-Dystroglycan and α- and γ-sarcoglycan bind to this recombinant, GAG-containing biglycan proteoglycan, while no binding of β– or δ– sarcoglycan is detected. Figure Lengend Snippet: Distinct binding sites for α- and γ- sarcoglycan on the biglycan core polypeptide A. Domain structure of biglycan, decorin and a biglycan-decorin chimera. The location of the pre-pro peptide (‘prepro’), 6-His tag, cysteine-rich amino- and carboxyl- domains, LRRs (ten open rectangles in the central domain; some schemes predict an 11th in the carboxyl-terminal cysteine-rich region) and GAG attachment sites (asterisks) are indicated. Note that these sites are present in the recombinant proteins used in this experiment, but they are not substituted with GAGs. B. Binding of sarcoglycans to biglycan, decorin and a chimera. One microgram of each of the purified recombinant proteins was separated by SDS-PAGE and either directly stained (‘silver’) or blotted and probed with 35 S-methionine-labelled, in vitro-translated sarcoglycans as indicated. Both α- and γ- sarcoglycan bind to the immobilized biglycan core but not to decorin core. In contrast, only α-sarcoglycan binds to the biglycan-decorin chimeric protein. Thus the first 30 amino acids of biglycan is necessary for its binding to α-sarcoglycan. Neither β- nor δ- sarcoglycan bind to biglycan, decorin or the chimera. C. Competition studies. Sarcoglycan binding to purified recombinant biglycan core polypeptide in the presence of excess MBP-Bgn38-77 (amino acids 38 to 77 of biglycan) or MBP-Dcn31-71 (amino acids 31 to 71 of decorin). These sequences correspond to the first 40 amino acids of the mature biglycan and decorin polypeptides, respectively. Four micrograms of biglycan were separated by SDS-PAGE and either directly stained with Coomassie Blue (CB) or blotted and probed with biotinylated (BT), in vitro-translated α- or γ-sarcoglycan as indicated. Binding of α-sarcoglycan to full-length biglycan was inhibited in the presence of MBP-Bgn38-77 , while binding between γ-sarcoglycan and biglycan binding remained unchanged. The decorin fusion protein did not inhibit this interaction. 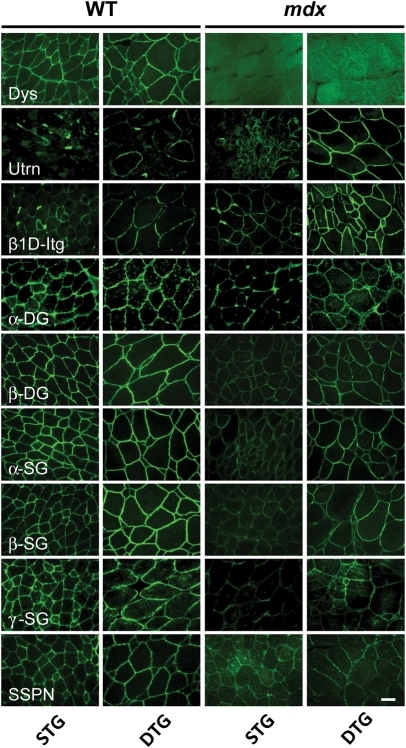 Article Snippet: Sections were stained with various combinations of antibodies against laminin, CD56, desmin and embryonic myosin (F1.652; Developmental Studies Hybridoma Bank); neonatal myosin (NCL-MHCn; Novocastra, Leica Microsystems A/S, Ballerup, Denmark); alpha-sarcoglycan (NCL-L-a-SARC, Novocastra); beta-dystroglycan (NCL-L-a-SARC, Novocastra); myogenin (F5d, Developmental Studies Hybridoma Bank); nestin, CD68, collagen IV and dystrophin (cat. no. D8168, Sigma-Aldrich Denmark A/S, Copenhagen, Denmark); myosin type I (BA.D5, Developmental Studies Hybridoma Bank) and myosin type II (A4.74, Developmental Studies Hybridoma Bank). Article Snippet: Exosome-Dynabeads Streptavidin (Life technologies) in PBS + 0.1% BSA were mixed with biotinylated anti-alpha-sarcoglycan (clone AD1/20A6 Monosan) according to the manufacturer’s instructions. Article Snippet: Primary antibodies were used against Tsg101 (1:2,000 dilution, clone 4A10 Abcam) and alpha-sarcoglycan (1:300 dilution, clone H-82 Santa Cruz). Figure Lengend Snippet: Analysis of patient material. Microscopical investigations (1A): (I) M. vastus lateralis biopsy of patient 1 showing a myopathic pattern with minor muscle fiber atrophy and hypertrophy as well as frequent nonsubsarcolemmal nuclei (arrows). Cryostat section, H E. Scale bar: 80 μm. (II) Low‐grade muscle fiber atrophy and solitary rimmed vacuole (arrow) in cryostat section of the rectus femoris muscle biopsy of patient 2. Cryostat section, H E. Scale bar: 50 μm. (III) M. quadriceps femoris biopsy of patient 3 showing minor atrophic as well as hypertrophic muscle fibers. Cryostat section, H E. Scale bar: 80 μm Electron microscopic studies (1B): (I) Subsarcolemmal membrane‐bound vacuoles, presumably corresponding to enlarged caveolae (arrows) in the muscle biopsy of patient 1. Scale bar: 250 nm. (II–VI) Patient 2; (II) subsarcolemmal membrane‐bound vacuoles (arrows) similar to the one depicted in Fig. 1 A. Scale bar: 200 nm. (III) Further abnormal membrane bound subsarcolemmal vacuoles as well as tubular structures (arrows). Scale bar: 2 μm. (IV) Large vacuole (asterisk) associated with a myonucleus. Scale bar: 4 μm. (V) Large (asterisk) and small (arrowheads) vacuoles in the vicinity of a myonucleus. Scale bar: 2 μm. (VI) Large vacuole containing autophagic material (arrows) associated with a deformed, possibly degenerating myonucleus. Arrowheads: Membranous material, presumably corresponding to a focal outfolding of the sarcoplasmic reticulum. Scale bar: 4 μm. (VII) Patient 3: subsarcolemmal membrane‐bound vacuoles (arrows). Scale bar: 800 nm. 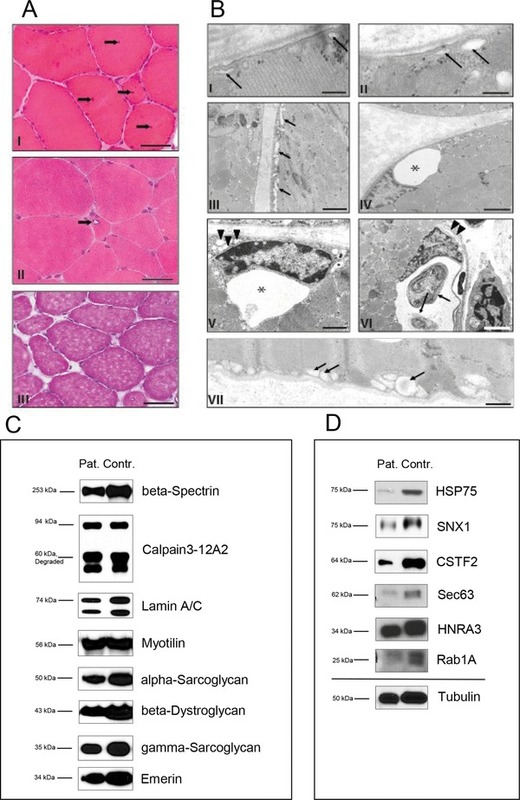 Immunoblots of myopathy‐associated proteins (1C): comparison of beta‐Spectrin, Calpain‐3, Lamin A/C, Myotilin, alpha‐ and gamma‐Sarcoglycan, beta‐Dystroglycan and Emerin in G56S Caveolin‐3 patient and control muscle revealed no significant changes in protein abundances. Confirmation of proteome data via immunoblotting (1D): immunoblot analyses of HSP75, SNX1, CSTF2, Sec63, HNRA3, and Rab1A revealed same changes in protein abundances upon G56S Caveolin‐3 expression like in the G56S Caveolin‐3 in vitro model. Tubulin was used as loading control. Article Snippet: The following proteins were investigated: Lamin A/C (Vector Laboratories, Burlingame, CA, USA), beta‐Spectrin, Calpain‐3, Myotilin, alpha‐Sarcoglycan, gamma‐Sarcoglycan, beta‐Dystroglycan, and Emerin (all Leica Biosystems, Nussloch, Germany). 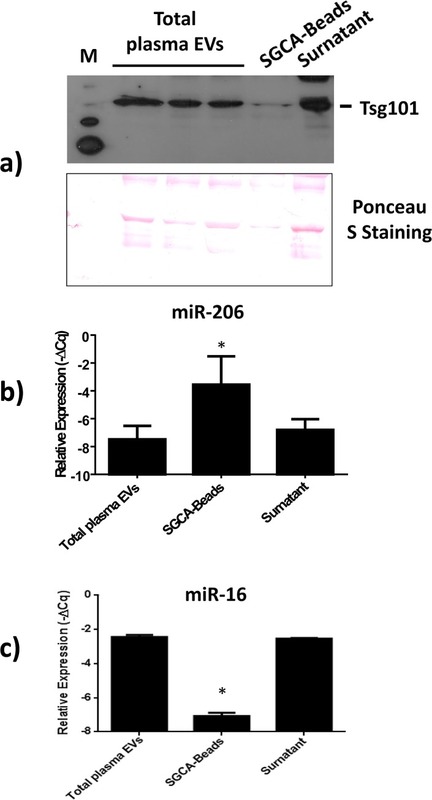 Article Snippet: The EVs were resuspended in PBS + 0.1% BSA and then stained with an anti-CD81 PE (clone BD Pharmingen, clone JS-81) or anti-alpha-sarcoglycan (clone AD1/20A6 Monosan) and labelled by goat anti-mouse (GaM) FITC.